City officials are taking first steps to make Oakland into what the World Health Organization (WHO) refers to as an “age-friendly city.” The initiative, known as Livable Oakland, is a part of a global effort to ensure that cities are equipped to meet the needs of older adults, who are a growing demographic worldwide. On Saturday, members of the Mayor’s Commission on Aging, along with staffers from the Center for Elders’ Independence (CEI), came to the West Oakland Senior Center to hear what Oakland’s District 3 residents had to say about how friendly to all ages their community feels. Residents were asked to give input on each of the 8 criteria identified by WHO as the key areas to examine when considering how suited a city is to the needs of older adults. Those include things like access to outdoor spaces, transportation and social inclusion. For each category, residents were asked: What’s working? What’s not? And what does Oakland need? This was the fourth presentation and listening session that members of the commission—11 volunteers appointed by the mayor to advise the Department of Human Services and city council on issues affecting Oakland seniors—have conducted with the CEI. 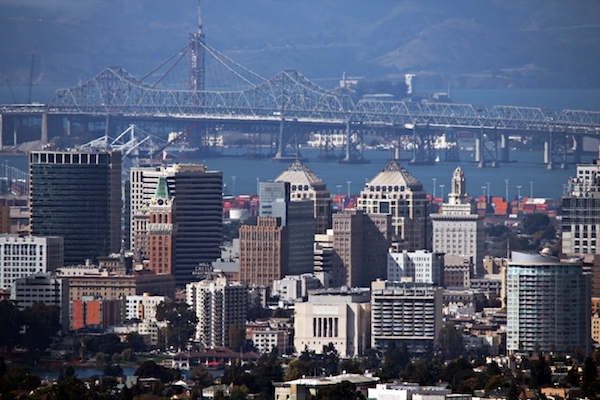 Previous sessions were held in the Fruitvale, Oakland’s Chinatown and East Oakland. Held across the street from an all-class reunion at DeFremery Park last weekend, the session was attended by only a handful of District 3 residents. Despite that—or maybe because of that and the snacks provided—the session was full of information being exchanged among residents and staffers, and ran over its allotted two hours. One of the most common concerns residents brought up was about older adults’ inability to stay in their homes over time due to rising housing costs. “I understand bringing in new people and that the dynamics have changed in Oakland, but you don’t throw out the old just to bring in the new,” said District 3 resident Jacqueline Jackson. When CEI staffer Dianna Garrett suggested that lowering the fees homeowners like herself have to pay for permits to build in-law units may be a possible solution, Jackson responded that there is no guarantee homeowners still won’t rent to the highest bidder. Ricks said the issue of transportation had also appeared again and again—not necessarily as complaints about lack of options, but about whether or not knowledge of those options is reaching older adults. Oakland resident Alvirdia Owens, for example, pointed to Inglewood’s Taxi Voucher Program, which will help pay for cab rides that cost no more than $15 total for adults who are 60 or older and who demonstrate a financial need. Later at the meeting, attendees discovered that a similar program exists in Oakland, known as Taxi Scrip, through which qualifying adults can purchase $10 taxi coupon books at the subsidized price of $3. The program is managed by Oakland Paratransit for the Elderly and Disabled (OPED). A few attendees, including Stadmire, expressed frustration at AC Transit, which she identified as an integral resource to older adults—more than BART. Stadmire said she often doesn’t learn of changes to AC Transit routes until an “effective date” sign appears at the individual stop. For her, that can mean anything from having to walk much further to get to the closest stop, or having to rely on more costly alternatives. Other issues that came up at the District 3 listening session were regular access to fresh, affordable food, and safety while in transit. “In my community alone, we’ve had at least five incidents where the residents going downtown [to get ingredients for meals] have been attacked, right near our own home,” said Jackson. Jackson, among others, also brought up the need for intergenerational park spaces, where older adults and their grandchildren can spend time together and play in a setting suited for both. A few meeting attendees remarked that sometimes even when park spaces are available, they are made unusable by a lack of maintenance. This can be aggravated by the city’s homelessness crisis, because people have to rely on outdoor spaces as places to hang out during the day, wash clothes, and take care of other daily needs without proper facilities to dispose of waste. In January, 2017, Alameda County’s point-in-time count reported 2,761 people with no homes are living in Oakland, over half of whom were unsheltered. Other themes included the need for in-home help for cooking and other tasks, people requesting information on nutrition, the need for more computer literacy programs, and most importantly, a desire for reliable and comprehensive communication regarding city events and resources for seniors via mail and email. According to WHO, which is a United Nations agency, the number of adults who are aged 60 or older is expected to double from 11 percent in 2006 to 22 percent by 2050, with a majority of them living in cities. WHO’s global “Age-friendly Cities” initiative focuses on ensuring that local physical and social environments enable older adults to maintain their health, independence and autonomy. And Oakland is aging, too. “The change in the overall demographics of the city is going to be a pretty significant thing,” said Ricks. “When I came into Oakland [in 2010], people over the age of 55 were about 10 percent of the population.” Ricks said that the number is closer to 17 percent now, with projections that by 2030, it will grow to 22 percent. Oakland becoming a part of the WHO Global Network for Age-friendly Cities and Communities is necessary to make sure the city is able to meet the needs of this changing demographic, said Ricks. According to results from an Oakland City Council candidate survey conducted by the Commission on Aging earlier this year, 70,000 of Oakland residents, or about 11 percent, are age 60 or over. The U.S. Census estimates that 12.2 percent of Oakland residents were 65 or older as of July, 2017. The Livable Oakland initiative began with a report from the commission to the city council in 2017, in which commissioners discussed issues relating to hunger, housing, and active aging for the city’s older adults. Commissioners recommended seeking the WHO age-friendly designation then. According to Oakland’s Aging and Adult Services Manager Scott Means, commissioners have since found that most issues pertaining to Oakland seniors could be consolidated with the work being conducted on the initiative, including information-sharing with experts from nearby cities like Fremont and San Francisco who are working on similar endeavors. In a report to the council this May, commissioners again recommended applying for the WHO designation, enlisting Mayor Libby Schaaf’s endorsement soon after. After more sessions take place on October 4, 6 and 13, the commission and CEI will conduct a city-wide survey so that staff can collect data from seniors who were not able to make it to the listening series. The survey will be conducted by mail and email through the city’s four senior centers, and through community organizations such as Oakland non-profit St. Mary’s Center, in order to reach unhoused older adults as well. AARP, previously known as the American Association of Retired Persons, will be supporting the city in ensuring the survey reaches as many seniors as possible, and that the data is properly collected and evaluated, according to Ricks. The commission will then formulate recommendations and deliver those, along with the results, to the city council. The commission expects to present its findings to council early next year, according to Means. That’s why it’s important to come out to the listening sessions and talk about what needs to change to make the city more livable for all, according to McDonald. “We have a voice. We’re also a big voting bloc,” she said. City of Oakland staffers and volunteers set up for the latest listening session of the Livable Oakland initiative at the West Oakland Senior Center on Saturday, September 29.